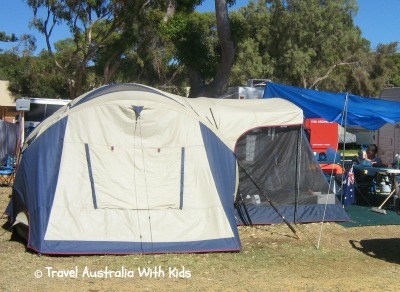 How did we get started on our family road trip and start travelling Australia? You might relate to some of the things we went through in getting started, especially if you are in two minds about your own family road trip; so read on - hopefully it will inspire you to get started with your own planning. We borrowed our friend’s tent – yes tent, no van at this stage – and all the equipment that we’d need. Oh and the coffee machine, and the air conditioner and the TV. My husband drew the line at the dish washer, something to do with plumbing - boy stuff. I lasted nine nights and we booked in another two. I loved it. Most days were at the beach, I read three books, wine o’clock was found. And surprisingly we could survive without the dishwasher. (Thanks mostly to the deal that if he wouldn’t let me bring it, then he would become it!). I truly embraced it and really couldn't wait to do it again. "Let's Travel Around Australia!" Hubby then suggested. 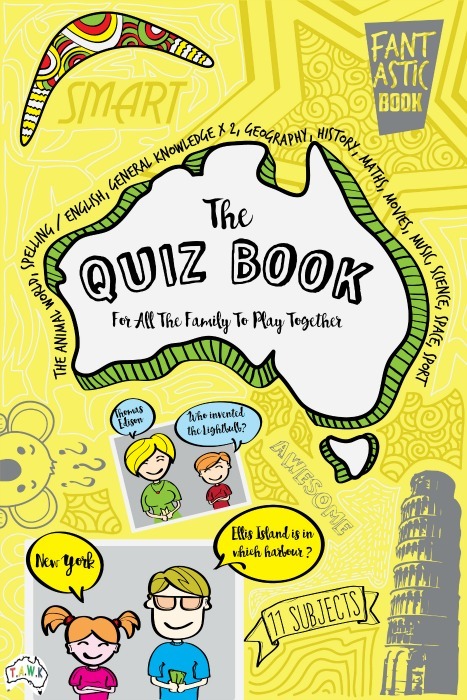 "Let's take the children out of school, buy a caravan, and do the family road trip to every state in Australia." Well, I had enjoyed the camping and I’d like to have a better look around this country - a family road trip sounded like a great idea.....but what about the children’s education? They need to continue to learn! Home School them? Me? Are you kidding me? No, not kidding. Right....Right. Next question "How long for?" - We had somehow found ourselves in a position, where hubby was working all the time and not able to spend as much time as he would like with the children and really felt like he was missing out. A friend had just be diagnosed with a terminal illness and something just clicked. We thought that we needed to do this trip now. What were we waiting for? After scouring the papers and internet for a caravan that would suit our family of five, we started to get a bit confused - there are so many to choose from (check out our Different Types of Caravans page) Which one would suit us? Our friends had a 'pop up and out one' that we were able to borrow and whilst it was great if we would just be holidaying in it, we felt that for our planned one year trip, it would be too much like hard work setting it up and down all the time. Then we came across an oldie but a goldie - could this be the one to do the family road trip in? It had three bunks at one end, separated by a privacy screen (we liked that!). Our bed was tucked up into the wall -not such a common feature nowadays - which gave the impression of so much room in the van. We LOVED it, but it was about 25 years older than we anticipated AND about $25,000 cheaper! SOLD! We bought it. The owner said he thought we looked like a nice family and threw in an annex and a generator. Hubby checked it over (and more importantly under) it was in great condition. 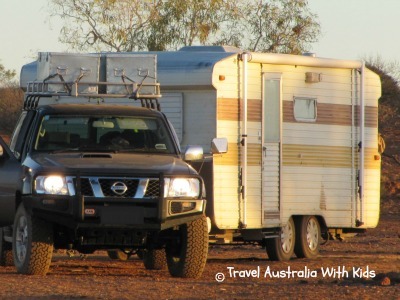 We started off with our trusty Ford Falcon - it was legally able to tow the caravan and all that we had in it. It was a great car. We didn't experience any problems. BUT it just did not 'feel' right. It was safe, but we did not feel safe. The kids were a bit squished in the back too. So we upgraded to a four wheel drive (above) - after all, we'd saved money on the caravan. This felt good. We really felt that we could do any thing and go any where, and we could - not always with the caravan in tow though. Our children were 6, 8 and 9 when we began our trip. In Western Australia, this meant that they were in years 1, 3 and 5. After investigating our options on how to home school our children, we decided that we would maintain our children's current enrolment at their school. I believed that Distance Education would be too restricting for us and at the end of the day, I was only going to be doing it for the family road trip and at this stage, not forever, so that ruled out Home Educator. I approached our headmaster and explained, what we intended to do and he gave us permission to remove the children for a year. At this point I headed to our local Educational store and scoured the shelves for books for all my children's levels in English, Maths, Society and Environment, and Science. I bought exercise books, learn to draw and art books, reading books and all the stationary required for a year on the road. There was quite a haul and it was fairly heavy! I attempted 3 hours per day, with a half hour break in the middle. I say attempted, because obviously many days we were travelling. On these days we would do times tables and spelling in the car. This was a great thing to do, with times tables, my youngest knew all of his times tables by the end of the trip as he was listening to his siblings recite theirs. My husband makes lists. They freak me out a bit, as there are lots of lists, lists with days on, lists with months on, lists with lists on. Now, it’s one thing making the lists, it’s quite another thing executing the lists. In fact, most of them remained lists and the others turned into ‘just do everything in the last week list’. Which is of course the one we did. I have now made a Camping List for you to get some ideas, with the reason why you need some of the stuff on there. You can also download it and print it off, so click here when you are ready and it will open in a new window. After the lists, comes the packing of the van. Quickly followed by the unpacking of the van, realizing that we cannot take even half of what we planned and then attempting the repacking of the van. This went on for a good few hours (although it felt like days! ), until one of our friends turned up - to cut a long story short, HE packed our van! It wasn't long after this that our family road trip began, not too far for our first stop; Moore River, Guilderton - as we thought we'd bound to have forgotten something and at least we would be close enough to go back and get it. At this point I will point you in the direction of the Family Travel Blog page as it continues with the full story of our family road trip, but with all the places we visited and our experiences along the way. I hope that you are already making your plans and would love to hear your thoughts so far or tell the TAWK community your story and how you got going, we'd love to hear from you.